Leigh Ellis, PhD, once seemed destined for a career intercepting passes as a professional rugby player. Now, the Dana-Farber researcher is devising plays to intercept prostate cancer cells before they become metastatic. These tactics could also potentially slow other genitourinary diseases, including kidney cancer. Ellis’ laboratory works to better understand the underlying genetic and epigenetic mechanisms behind the disease, so that patients whose cancer is more likely to metastasize can be identified in advance—even as early as their diagnosis. “A resistance mechanism is where the prostate cancer has a cell identity of one type but can switch to a different drug identity to escape the drugs we use currently in the clinic,” explains Ellis, who recently received a Young Investigator Award from the Society for Basic Urologic Research, Inc. (SBUR) for his work pursuing the molecular drivers of prostate cancer development and progression. Leigh Ellis, PhD, works to better understand the underlying genetic and epigenetic mechanisms behind prostate cancer. Growing up in Australia, Ellis was both an athlete and a scholar. He played his first rugby game at age 4, and developed into a strong amateur player who received invitations to try out for professional teams. Eventually his interest in science won when a life-defining moment changed his mind while pursuing a career in sports medicine. While working in a hospital diagnostics lab and attending university, Ellis helped a pathologist evaluate a patient who came to the emergency room “feeling sick.” They diagnosed the patient’s chronic lymphocytic leukemia, and once Ellis saw the textbook pictures come to life under the microscope, he shifted his educational focus to cancer research. 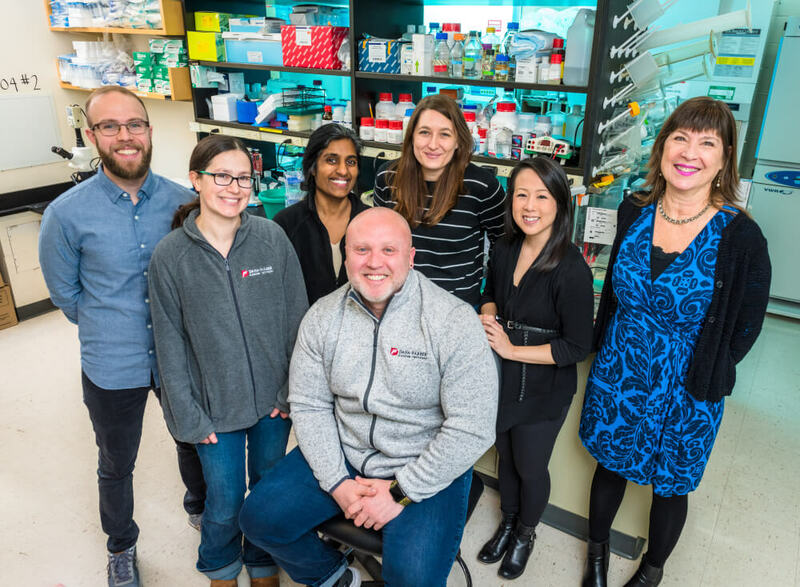 Leigh Ellis, PhD (front), with members of his lab team (left to right): Zachary Richards, PhD, Deborah Burkhart, PhD, Anjali Sheahan, PhD, Katherine Morel, PhD, Melissa Huynh, MD, and Joan Coraccio. Melissa Huynh, MD (black sweater) and Joan Coraccio (blue dress). He later completed his postdoctoral work at Johns Hopkins University and the Roswell Park Comprehensive Cancer Center with Roberto Pili, MD, who encouraged him to further home in on epigenetics. This led Ellis to collaborate with Massimo Loda, MD, at Dana-Farber, and when Loda became chair of Dana-Farber’s newly-established Oncologic Pathology Department, in 2017, he invited Ellis to establish a lab here. Now, Ellis collaborates regularly with Dana-Farber oncologists such as Christopher Sweeney, MBBS, and Toni Choueiri, MD, who enjoy his enthusiasm, energy, and his athletic pursuits—which have included weightlifting and a stint competing in the amateur division of the Mr. Universe competition. Ellis usually arrives at his lab before sunrise, and trains four nights a week. 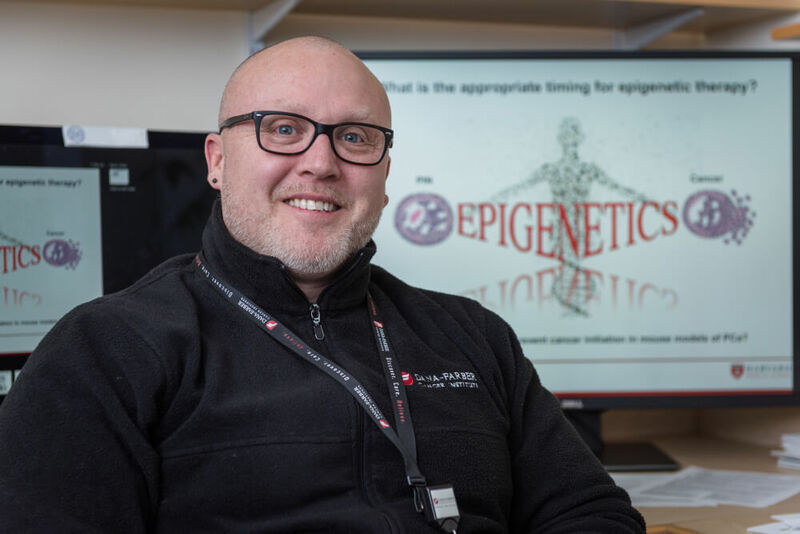 Ellis’ lab is now developing a clinical trial to learn more about which epigenetic mechanisms are most capable of causing the switches that spare them from cancer treatment, and targeting them earlier on. Some of the findings, he believes, could be applicable to kidney cancer patients as well. Sweeney, who is encouraged by the clinical implications of Ellis’ research, says it could very well lead to more effective treatment approaches and be ready for a clinical trial in the next one to two years.